What bird comes in packs of 20 or more? 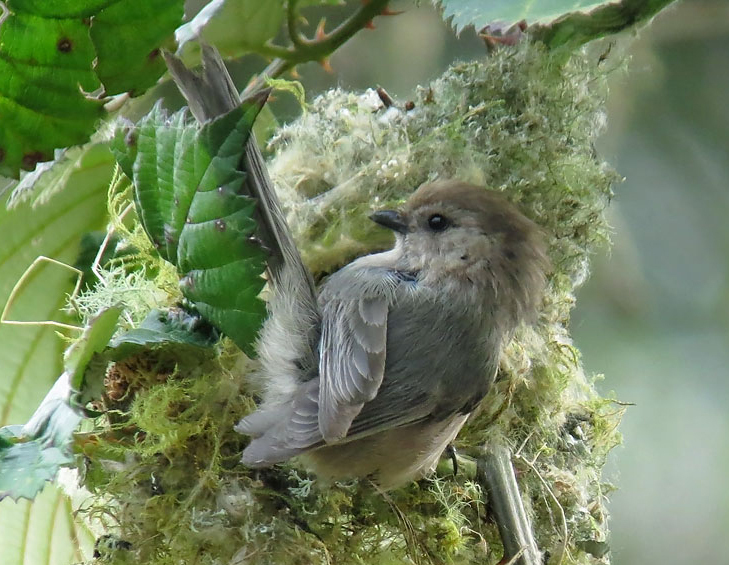 Weighing about as much as four paperclips, Bushtits are smaller than many hummingbirds. And they take full advantage of their diminutive size. While larger insect-eaters forage on the upper surfaces of leaves, Bushtits hang beneath them, plucking all the tiny insects and spiders hiding out of sight. They pair off to nest. (This male Bushtit is working on his nest.) 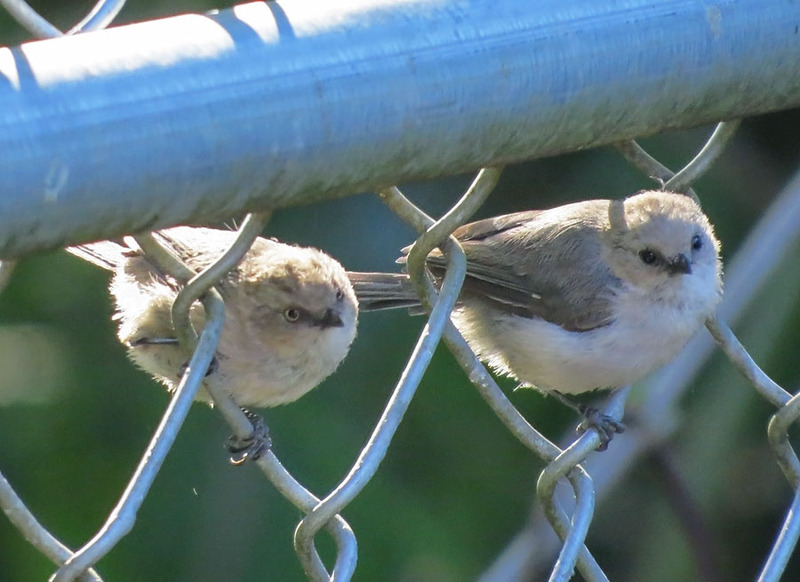 Where they live in Western suburbia, a flock of Bushtits can help rid a garden of harmful aphids and scale insects. Shun the pesticides and let these guys do the work! Only a few songbirds anywhere in the world are as small as Bushtits. Weighing in at 5.3 grams – that’s about the weight of four paperclips – they are smaller than many hummingbirds. 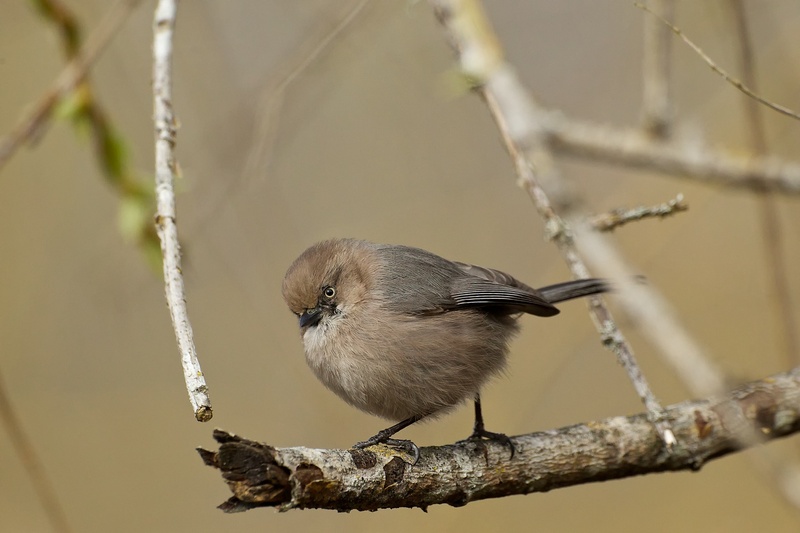 Take a close look at a Bushtit, and you’ll marvel at how tiny it is. But Bushtits take full advantage of their diminutive size. While larger insect eaters forage on the upper surfaces of leaves and twigs, Bushtits hang beneath them. That gives them exclusive access to all the tiny insects and spiders protected from the rain and hiding out of sight of other birds. 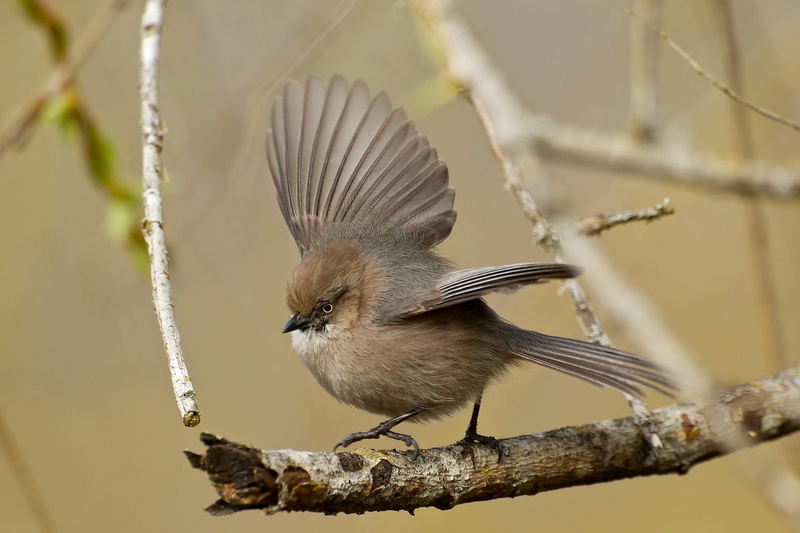 Watch a foraging flock of Bushtits, and you’ll have to smile. A shrub or small tree may be full of little brown, long-tailed birds hanging upside-down like Christmas-tree ornaments. After they finish nesting, Bushtits go about in flocks of 30 or more. One bird after another flies from bush to bush, like a troop passing in review. Their quiet calling helps them keep track of one another. Where they live in suburbia, a flock of 30 Bushtits can do a great job of ridding a garden of harmful aphids and scale insects. Good things do come in small packages! Thank you for listening to BirdNote. If the program has made a difference in your life we hope you’ll tell us how, at our website, birdnote.org. I’m Mary McCann. Bird sounds provided by The Macaulay Library at the Cornell Lab of Ornithology, Ithaca, New York. Calls of flock  recorded by G.A. Keller. Reduce your use of pesticides. Learn how! Has BirdNote had an effect on your life? Let us know how!